"Real gangstas don't smile in pictures. This woman put her blood sweat and tears into raising all of us. 91 years of being amazing. My Gogo". "Hi Everyone, As you'll know when you watch the Daily Show tonight I don't have a voice right now. I thought that my vocal cords were healed but according to the doctor, flying 36 hours and hosting a giant concert in South Africa didn't help me. So now if I want to get better I have to take it seriously so that i can perform at 100% on my new tour next year. I hate cancelling shows but i also hate the idea of loosing my voice forever so I'm postponing all this year's stand up shows and working hard on rehabbing the voice. I'm gonna be like The Rock but in a voice gym. Thank you again for the love and support. I appreciate you". 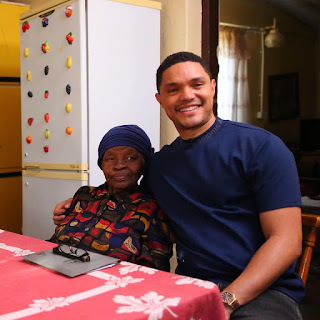 He was born as Trevor Noah in Johannesburg, South Africa on the 20th of February, 1984 (34 years old), he is popular for doing stand up comedy all over the world.